The city of Hong Kong goes all out for Christmas--lights, decorations, music. On Christmas Eve, all the roads were shut down for cars and the streets were flooded with people celebrating. Anywhere you turn, you bump into a Christmas choir, Santa, or marching band. It's impossible to miss the festivities. Despite all this, Christmas just isn't Christmas unless you're home. We feel a little lonely but very blessed to have each other on our first married Christmas together. We hope you are in a warm place with the people you love as we celebrate the birth of Jesus. you two are so cute and so talented! Merry first married Christmas! 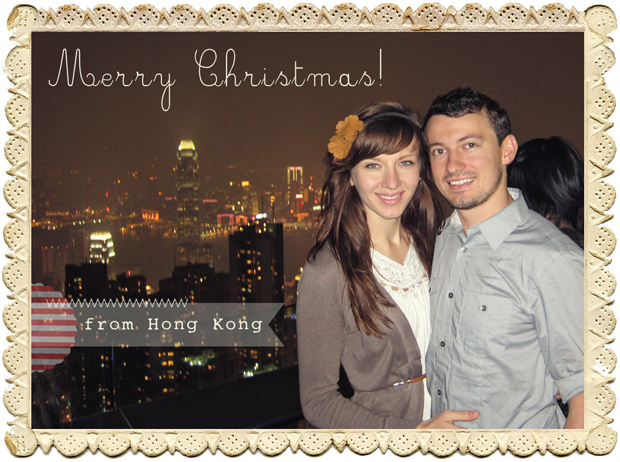 Merry Christmas to you Julia & Yuriy! Merry Christmas! Though you're far from your families this year, may the holiday be memorable and joyous for the two of you! A very merry Christmas to you too!! I'm so glad I found your blog and that you've both decided to share your adventure with all of us. Thank you! Happy Christmas from Bali, how are you dealing with the shock of Asia after the order and beauty of a snowy Vienna? Best wishes for a festive week. Merry Christmas! Many blessings Yuriy and Julia! Best Gift of Christmas is Jesus! May He fill your heart.